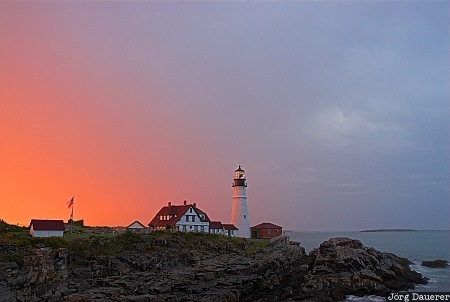 A spectacular sunset behind Portland Head Lighthouse at Cape Elizabeth as a thunderstorm arrives. Cape Elizabeth is in southern Maine near Portland at the east coast of the United States. This photo was taken in the evening of a windy and rainy day in September of 2006. This photo was taken with a digital camera.